Keeping in mind the patient’s comfort, with an innovative widespread design, which provides an opening of 70cm that allows the acquisition of images for patients weighing up to 485 lbs (220 kg). It has the capability to perform very advanced studies in Neurology, offering great information to neurosurgeons. Obtains faster and higher quality images, also making mammary perfusion. We offer the latest in oncology studies, obtaining full body studies in just 20 minutes, managing to detect lesions as small as 2 Milimeters. We have the capacity to perform Cardio morphological, Anglo MRI, Cardio Morphological and Perfusion studies. 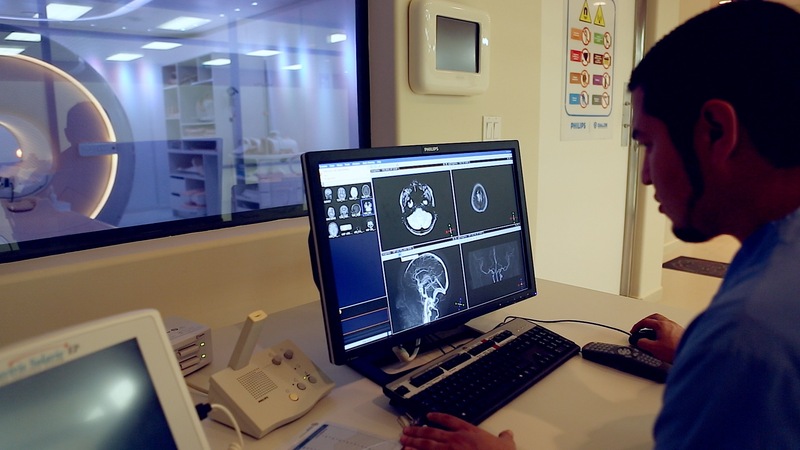 Thanks to one of our many MRI features “ambient experience” we were able to process pediatric studies in less than 10 minutes, thus elimination in most cases the need of an anesthesiologist. Our MRI equipment has the capability of obtaining an accurate diagnosis of illnesses or pathologies that affects the vascular system. Magnetic resonance spectroscopy (MRS) is a diagnostic technique that provides a biochemical, metabolic and functional serial assessment in nervous system diseases which complement conventional studies.